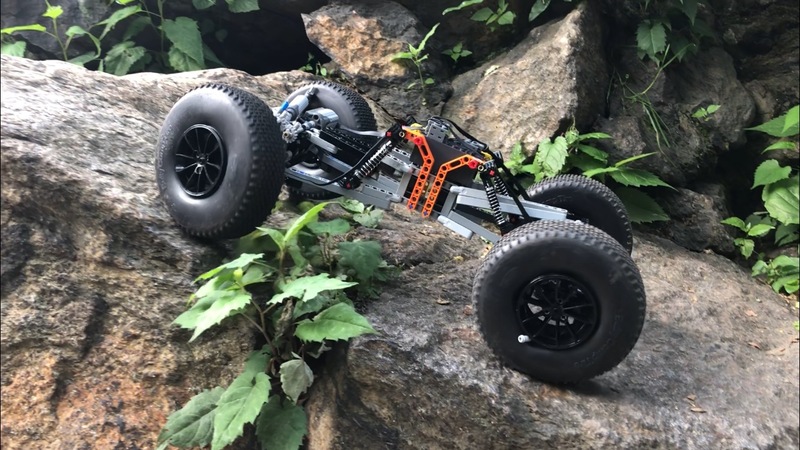 PunktacoNYC back again with another rock crawler! This time it's called the Rocket Crawler and it is my largest, fastest crawler yet. 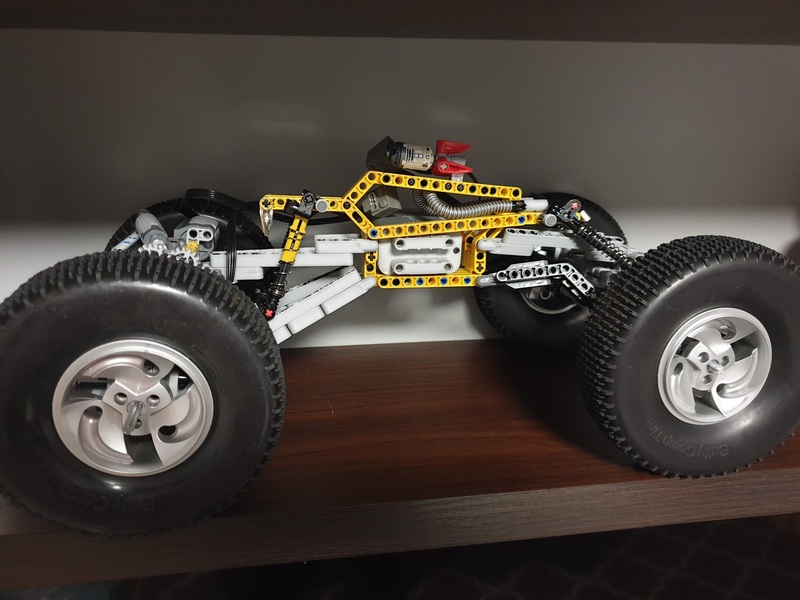 The initial inspiration for this crawler was twofold; I wanted to build a RC competition super-class-like crawler, what with giant relative wheel size, slim body, and high articulation. 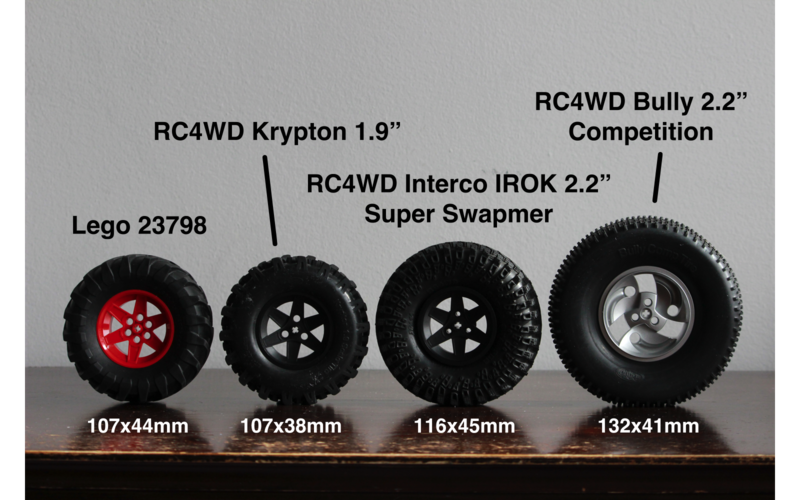 I also really wanted to make use of RC4WD's quite large Bully competition tires. This project has been in development for over a year thanks primarily to issues with the front axle. 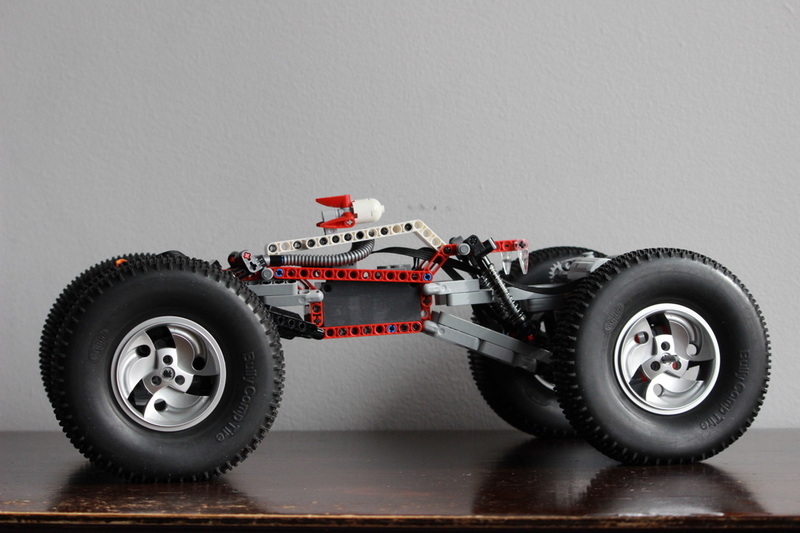 The problem with the front axle was that Lego universal joints simply could not handle the high torque required to spin such large tires. 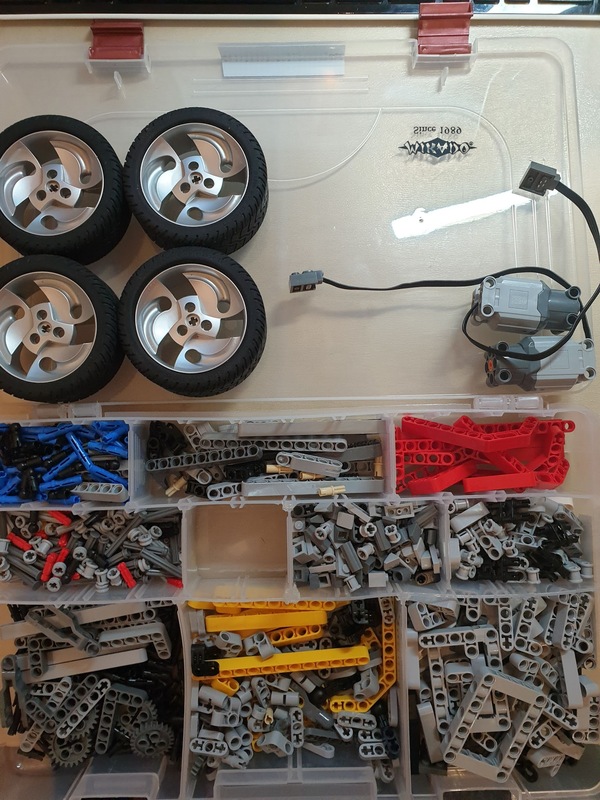 I tried using custom Lego universal joints custom dremeled brass remote-controlled boat u-joints, and even knob gears at the pivot point - nothing worked. So, I mounted the motors directly to the wheels, all within a virtual system to move the steering pivot closer to the center of the wheel for a better turning radius. This has been my favorite project. Let me know what you think. Man that thing is awesome. Gotta love the steering system! I absolutely love this build and was one of the ones who build your chili crawler. However, not too sure about the tire choice. I get 2.2 instead of 1.9, but the tires used don't look very grippy or knobby. One of the benefits to having such a great steering system in a crawler is to steer the vehicle back and forth as it climbs, but only if the hope is the that knobby tires can catch something. There really isnt any knobs on the outer edges of these tires. You probably would get much better results switching to other ones. Either way though.... the virtual steering system is genius and one L motor per tire? That is incredible. 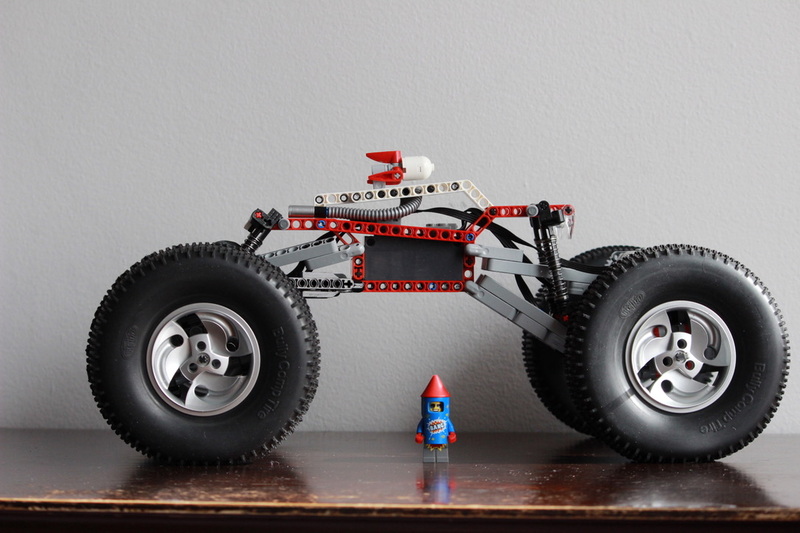 It would be fun to build this and pit it against the chili crawler. If you were to make instructions I would definitely be one to build it. Thank you! And you are correct in that the lack of knobs on these tires is detrimental to its grip, particularly on loose surfaces. But, I've found that the Bully tires work quite well when kept on plain rock and grass. I'll be working on instructions on my next large bout of free time, whenever that may be. That is very good news. I will definitely be building it. 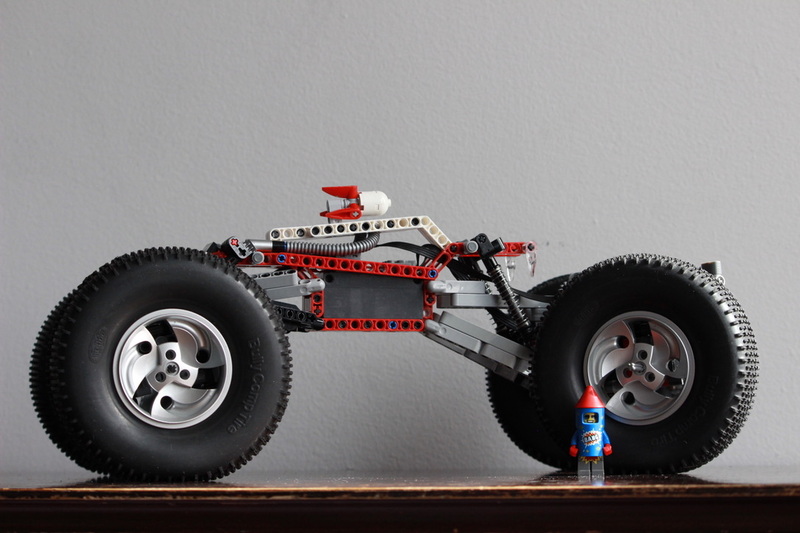 Your Chili Crawler was pretty much the ONLY Lego RC vehicle that I have considered fun to drive. Grazie! E tu hai ragione nel senso che la mancanza di manopole su questi pneumatici è dannosa per la sua presa, in particolare su superfici sciolte. Ma ho scoperto che le gomme Bully funzionano abbastanza bene se tenute su roccia e erba. Lavorerò alle istruzioni per il mio prossimo periodo di tempo libero, in qualunque momento. hello...I wanted to ask you a question ..... unfortunately I'm a beginner with moc .... you surely know more than me ... the receiver sbrick that you know has the doors stabilized to 9v? so using the buwizz in ludricous mode how does the receiver behave? So, I have BuWizz 1.0, which does not have ludicrous mode. But, my BuWizz does have the fast mode which supposedly outputs 9.2v, and there is a noticeable difference between regular Lego Lipo rechargeable battery/BuWizz normal mode and BuWizz fast mode. I have not had any power stability issues with the BuWizz fast mode and Sbrick - the two work together excellently. Quindi, ho BuWizz 1.0, che non ha la modalità ridicola. Ma, il mio BuWizz ha la modalità veloce che presumibilmente produce 9.2 v, e c'è una differenza notevole tra la normale batteria ricaricabile Lego Lipo / modalità normale BuWizz e la modalità veloce BuWizz. Non ho avuto problemi di stabilità di potenza con la modalità veloce BuWizz e Sbrick - i due lavorano insieme in modo eccellente. 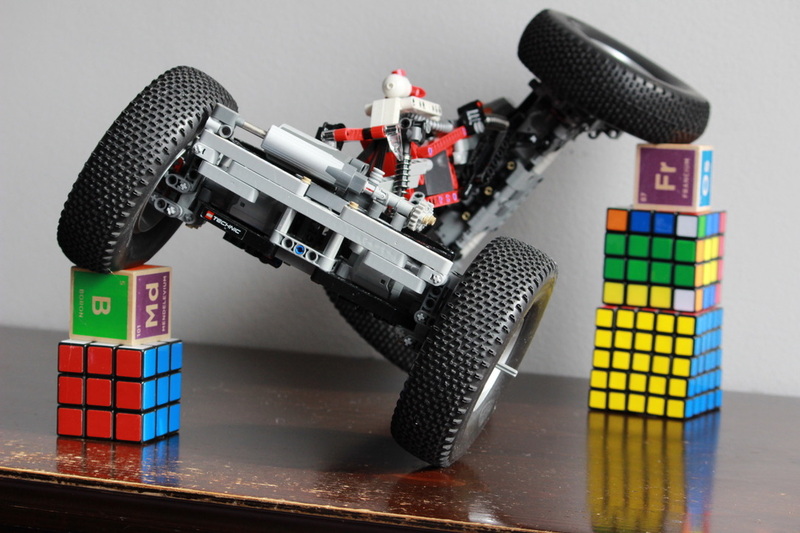 @nerdsforprez Well I had some free time, so here are the Rocket Crawler instructions, in LXF form. There are photos in the brickshelf folder as well which clarify incorrect parts of the LXF. Great! Thank you!. I will get around to building this, but unfortunately it may not be for a long time. Work has (literally) taken me from my collection, and I won't be home any time soon. Am I'm starting ok with LDD? I know that there are some differences between reality and lxf but I had some problem during instalation LDD on win10, so just to be sure that it's ok and that im starting from the same point as others :) Can You check below that this is how it should look in LDD on the begining ? 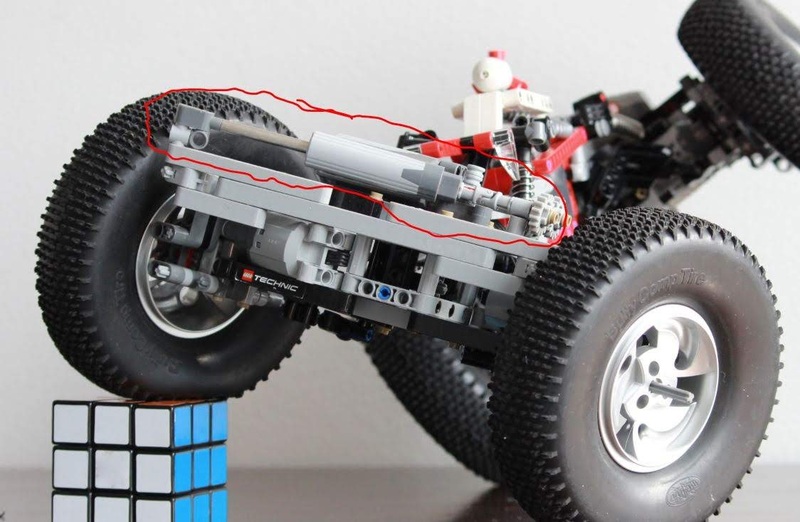 If possible and if above images are correct can You direct me how I should looking for missing pieces and their lego parts number like below brick? In some cases, the incorrect pieces on the LXF are not a big deal, and do not affect performance. The incorrect parts that do affect performance are obviously incorrect, as they don't fit in the model or don't function correctly. When you come across a weird building step, or a piece that seems too loose or disconnected from the rest of the build, check this folder to find a photo with the correct piece placement. Last question or rather preatty please :) Would It be a big problem for you to check this punktaconyc_rocket_crawler_lxf.xlsx file produced via LDD and write there on the bottom missing brick numbers that You remember that are missing or incorrect on the LDD like the brick that I circled on the previous photo? 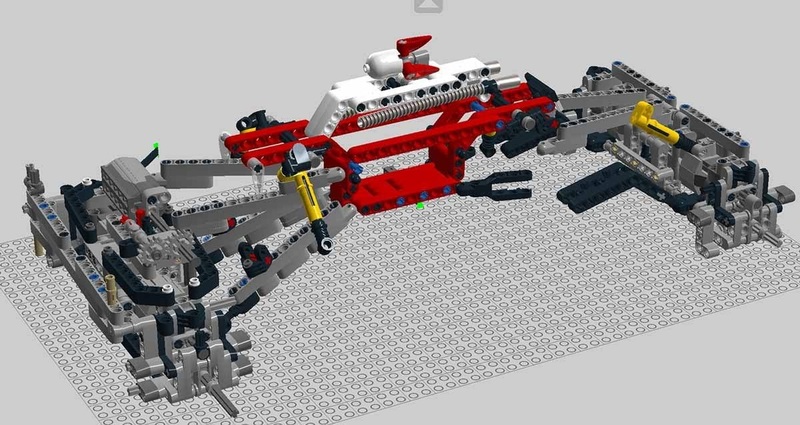 I do not have many technics brick and in most of case Im going to search and buy them via Lego shop or bricklink so it would be much easier for me to know before building what to search and group the order. Here you go. Hope this helps. As always, lmk if any further issues arise. Thank You very much. It's much easier for me now. Could You explain me what is the function for bb339c01 ? And Do I need to buy sbrick or buwizz will be enought ? Could You explain me what is the function for bb339c01﻿ ? And Do I need to buy sbrick or buwizz will be enought ? Oh yes, forgot about that polarizing switch. 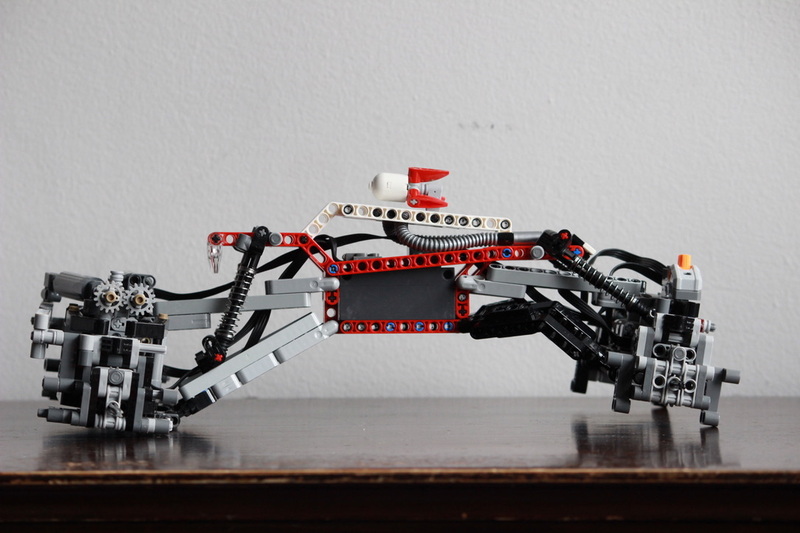 It is necessary because there are four drive motors and one steering motor - five in total. 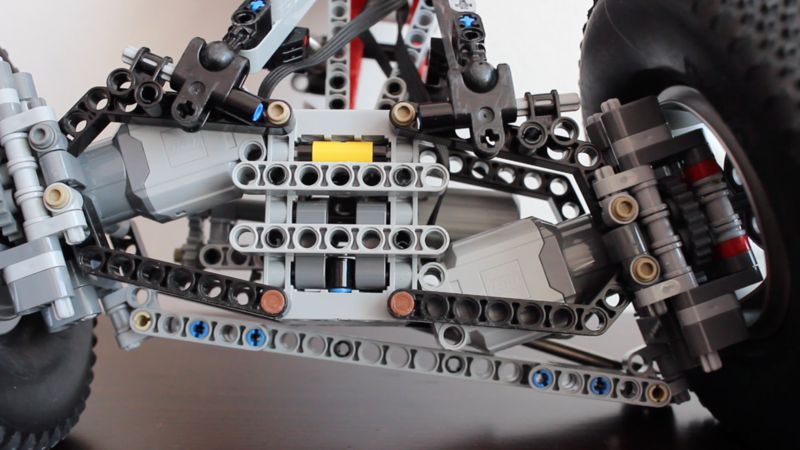 Because I wanted independent front and rear axle control, I would need a minimum of three ports, which the SBrick and BuWizz both provide. But, because the two motors in both the front and rear axles are facing different directions, one needs its direction reversed. The polarizing switch reverses the direction of one of the rear drive motors so that drive for the rear axle can take up only a single port on the BuWizz, reducing five different wires to fit on four ports. For example, port 1 on BuWizz may be front right drive motor, port 2 is front left drive motor inverted, port 3 is steering, and port 4 has both rear right and rear left drive, one inverted using the polarizing switch bb339c01. BuWizz is enough to control the truck with full power. I use an SBrick as it allows better, custom control schemes on my phone with which I am more used to controlling my creations. That being said, if you have an ios device and an MFI certified gamepad or an android phone and compatible gamepad, the app "Brickcontroller2" allows you to control your creation with a game controller, which I would argue is the best of all methods, and only requires BuWizz. I recently bought a Steel Series Nimbus controller to connect to my iPad and BuWizz and it is awesome. I haven't tried it on my Rocket Crawler, though I'm sure the analog controls would be a welcome upgrade. Cool! I can't see the picture tho. I wanted to ask because you have more experience. 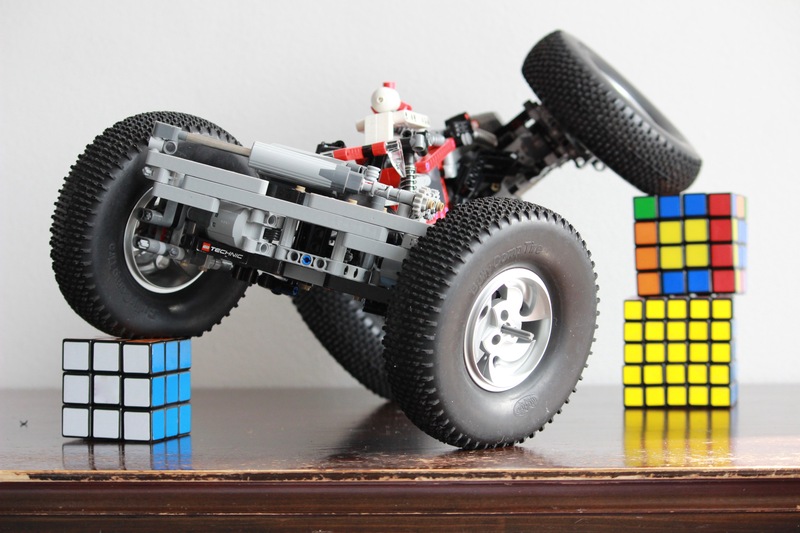 I want to take one of these models https://wisepick.org/best-rc-rock-crawler/ and remove all the plastic, instead, I want to put the body assembled from Lego, of course strengthening it. Do you think this is real or the idea is doomed to failure?